In a rare show of generosity from an Internet service provider, Verizon plans to boost FiOS upload speeds to match customers' download speeds at no extra charge. ISPs typically offer much slower uploads compared to downloads. Under Verizon's previous plan, for instance, customers with 15 Mbps downloads only received 5 Mbps uploads, and customers paying for 500 Mbps download speeds only got upload speeds of 100 Mbps. Faster upload speeds are especially useful for posting photos and videos to social networks, or sending files to online storage services. Verizon points out that a 1-hour HD video would have taken 16 minutes to upload under a 50 Mbps down/25 Mbps up plan, but that same video will only take eight minutes once upload speeds are raised to 50 Mbps. The increased speeds will roll out to all Verizon customers through this fall, but users can get those speeds now by signing up for Verizon's My Rewards+ loyalty program. Why the random act of kindness? 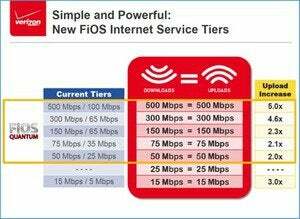 The Wall Street Journal reports that FiOS subscriber growth is slowing, and that faster uploads are a way to differentiate from cable. The Journal quotes Robert Mudge, Verizon's head of FiOS, as saying the speed boost required hardly any additional investment for the company, while similar upgrades would be much costlier for cable providers. On a more cynical note, Verizon may simply be looking for a cost-effective way to prove that broadband competition is alive and well, as all ISPs face greater scrutiny on the issue of net neutrality. Under new rules proposed by the FCC, Internet services and websites would be allowed to pay service providers for faster delivery speeds than the baseline service that all customers get. Tech companies and advocacy groups have shown opposition to these "fast lanes," and some have argued that Internet service should be regulated as a utility—a move that ISPs say would stifle competition. Meanwhile, Verizon is in the middle of a scuffle with Netflix and its traffic delivery partners over the delivery of streaming video. As the two sides argue over who should pay for capacity upgrades, customers are suffering from slower speeds. In other words, if there was ever a time that Verizon needed to generate some goodwill, this is it.